RacerWorld.com officially launched today with over 500,000 new and used high-performance auto racing parts. The new website is designed to appeal to circle, drag, and street racing enthusiasts. For more information see the official press release here. Years before his success with NASCAR, Kasey Kahne was in the driver’s seat of a World of Outlaws sprint car. His return as a race promotor is sure to bring over many new fans and increase the popularity of the sport. Kahne will lead a mini-series of World of Outlaws events at three tracks this season beginning on Friday and Saturday, March 19-20, at Volunteer Speedway in Bulls Gap, Tennessee. Here’s some footage of a Kahne-owned car driven by Joey Saldana winning in Georgia. Knoxville Nationals: Are You Going? Yes, it is still about six months away, but some are already planning for the 50th Annual Knoxville Nationals. Here’s a WhoWon.com article we found with some great deals for fans during their stay in Iowa. The package includes hotel, daily shuttle transportation, tickets to the National Sprint Car Hall of Fame and the Iowa State Fair, and even giveaways and prizes. August 11-14 will be here before we know it, so be sure to follow us on Twitter and Facebook for more details about the Knoxville Nationals and other upcoming races. We’d like to welcome you to the official Racer World blog! Here you’ll find industry news, event updates, tech tips and much, much more. Racer World is a brand-new website that aims to be the premier site for auto-racing enthusiasts. We’ve taken all the aspects of our favorite racing websites and put it all on one site. Such as the marketplace, at anytime you’ll have access to over 500,000 parts and products from the industry’s top manufacturers and private sellers. 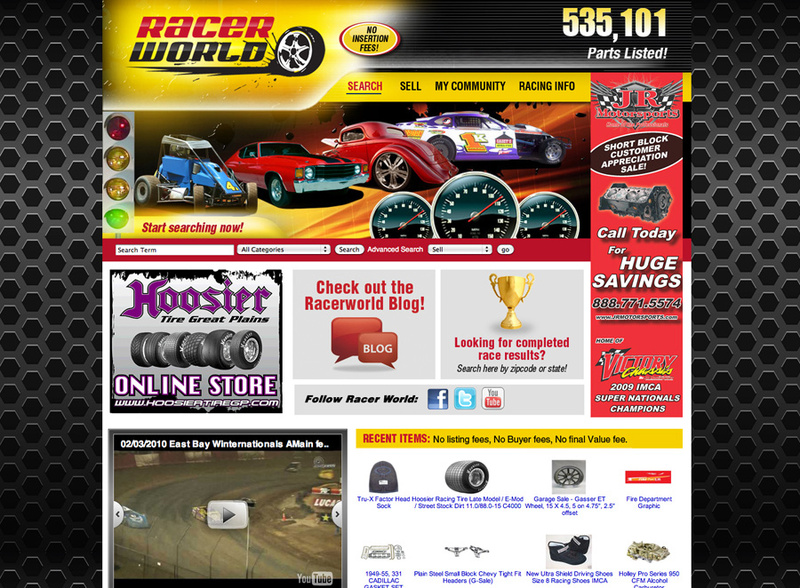 Interested in using Racer World to sell your parts? There are zero insertion fees! Some of the website’s added features are still being fine-tuned, but we’d encourage you to visit the track directory and begin planning your 2010 season. Also be sure to check in with us on Facebook and Twitter , we want to connect with you! Thanks for stopping by and be sure to come back again!